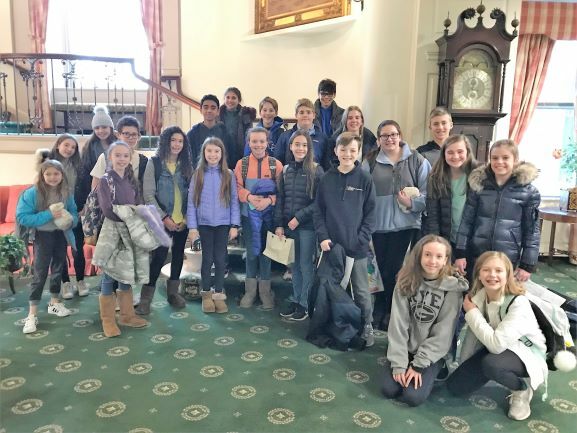 Each month two energetic and caring groups of middle and high school students who live or attend school in Rye visit residents of The Osborn Retirement Community, as part of the Rye Youth Council Grandfriends’ programs. What’s readily apparent during each of these visits is that everyone who participates — kids, senior residents, caregivers, and volunteers — receives as much as they give. The gifts of intergenerational programs are abundant. Children today are less likely to know their grandparents well or visit with them frequently. And for older adults, developing connections with younger people can give them a greater sense of fulfillment. The kids agree. Here are first-hand experiences from two students who regularly attend the Grandfriend programs. 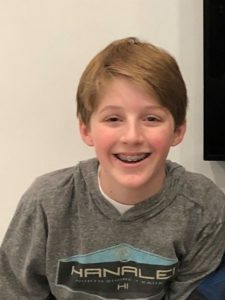 Eighth-grader Mark O’Brien shared, “Over the last few years, I have grown to love going to The Osborn every month to visit and talk with residents. While the fun activities we do may just consist of coloring or decorating cookies, the real joy is the time we spend hearing their array of stories — on subjects from German boarding schools to World War II to engineering, and marketing. It is so nice to see the smile that comes to every resident’s face when we begin to engage in conversation. “Sometimes kids play instruments or sing songs taught to us by the residents; my favorite being ‘If You’re Irish’, which Anne led us in. We usually finish every session with ‘God Bless America’. 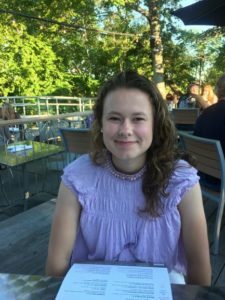 Senior Beatrice Flynn feels lucky to have participated in Rye Youth Council’s Adopt-A-Grandfriend Club the past four years, and this year is a co-president. “Our mission is simple yet incredibly rewarding. Right after school we go over and spend time with Osborn residents for an hour or so. There are no required topics or questions that must be asked; the conversations are informal as well as exciting and engaging. “I have come to understand how mutually beneficial the whole experience is for both parties — elders and high schoolers. I recognize how uplifting our presence is for the residents of The Osborn. They genuinely enjoy chatting with us and receiving our youthful perspectives on a vast variety of topics. Likewise, the high schoolers, myself included, are excited to hear their fascinating life stories and gain their unique outlooks. “One of my fondest memories is of a visit with a woman who was born into an Italian immigrant family and grew up in the post-World War I era. She went on to tell me in detail about her experience living through World War II. I was and still am impressed by her ability to meticulously recount stories and memories. She told me about her children, grandchildren, and even great-grandchildren with such pride and joy it was radiating off of her. I was captivated by her master storytelling and enthusiasm. “This amazing senior also peppered me with questions about school, hobbies, family, and friends. I could tell that, aside from wanting to tell me about herself, she genuinely wanted to learn about who I was and what I loved to do. I walked away from our conversation and the visit as a whole feeling a hundred times better than I had when I entered The Osborn that day.